Can Oil & Oxygen Ignite without a Spark? Combustion describes a chemical process whereby rapid oxidation produces heat. In everyday terms, it’s the process that produces heat on a cold evening when you light a fire in the fireplace. Combustion requires three things to occur: an initial ignition source, such as a match; fuel, such as firewood; and an oxidant, aka oxygen. Combustion results in a number of products: in the case of organic combustion, carbon dioxide, water and energy. In combustion, chemical bonds are broken and new bonds form. Energy is required to break the molecular bonds: the endothermic part of the process. When new bonds form, meanwhile, energy is released: the exothermic part of the process. If the overall process produces more energy than it uses, the sum of the process is exothermic and produces energy as heat or heat and light. If a material produces an exothermic reaction, it is said to be combustible. As noted, every combustion process requires an initial influx of energy to break the first bonds. An ignition source, such as a spark or flame, provides this energy. Once the combustion process begins producing energy (exothermic), the combustion process continues until it completely consumes either the fuel or the oxidant. In other words, an exothermic process is self-supported once initiated. The first required reactant in combustion is a fuel. Many of these fuels, called combustibles, are organic. Organic materials contain carbon, hydrogen and oxygen. However, some inorganic materials, such as magnesium, are also combustible. The second required reactant in combustion is an oxidant. Oxygen is the universal oxidant and required for all combustion. Combustion will not occur without both of these reactants. Remove the fuel from a fire and it goes out. 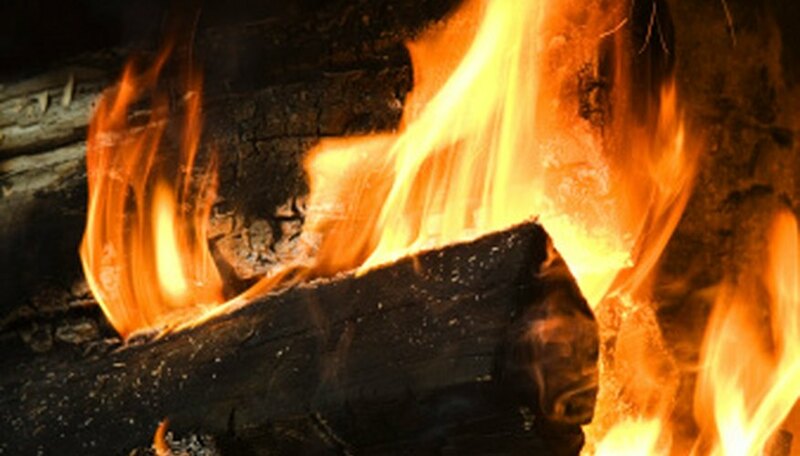 Likewise, remove the oxidant – by smothering the flames – and the fire also goes out. This is the purpose behind fire extinguishers. The combustion of organic materials creates a number of products. The first product of organic combustion is carbon dioxide. The second product of organic combustion is water, typically released as water vapor. The third product of organic combustion is energy, released as heat or heat and light. Because there are other molecules present in most fuels, the combustion process is not entirely clean. This means it produces small amounts of other materials, many of which are potentially harmful. Inorganic combustion does not produce carbon dioxide or water. For example, when magnesium (fuel) reacts with oxygen (oxidant), the result of the combustion process is magnesium oxide and heat. The one constant in combustion, regardless of the fuel, is the release of energy as heat or heat and light. Indiana University Northwest: Combustion Reactions; N. De Leon, Ph.D.
What Are the Reactants & Products in the Equation for Photosynthesis? Bennett, Doug. "What Are the Reactants & Products in a Combustion Reaction?" Sciencing, https://sciencing.com/reactants-products-combustion-reaction-8433780.html. 16 May 2018.